As a person who has never liked sushi, I commend a friend of mine for taking me to Sushi Samba on Lincoln Road in Miami. The atmosphere is relaxing and there’s plenty of things to watch as you dine outside on the patio. As an avid people-watcher you will not be disappointed. The inside is great for those who prefer to avoid the South Florida heat and dine in the air conditioning. Whether diners sit at the bar or at the many tables located inside they will enjoy the techno beats of the DJ. Let me also add the most important factor that made this restaurant so amazing-the SERVICE! The service was outstanding. For South Beach, this is a rare commodity because many restaurants will include a 15-20 percent tip automatically-therefore leaving servers to care less about you and more about themselves. I will recommend this restaurant to everyone looking for a cozy spot to grab a bite in Miami. The menu is eclectic containing dishes from Brazil, Peru, and Japan. For appetizers, we split the crispy tequitos which came with a spicy sauce and lime on the side. Inside was flavorful, juicy beef mixed with vegetables and lettuce. Next we had the shrimp seviche ($14.00) which was blended with passion fruit, cucumber, and cilantro. Not only was this my first time trying sushi, but seviche as well. I’m a new fan. Please try this dish if you’re a seviche supremist serching for something new or if you’ve never tried seviche before. It was very sweet and full of delicious tangy flavors. The sushi that made me fall in love? The Maya Roll ($10.00) which includes shrimp, avocado and salsa…mmmm…I’m ready to go back for more just thinking about it! Dip a roll into the shrimp sauce on the side of your plate and you’ve just experienced a piece of heaven. I also tried the Samba Dromo Roll which wasn’t too bad either. Starting off on California Rolls, I was wary as to what this would taste like. Thankfully, it was nothing like a California Roll. The Samba Dromo consisted of lobster, mango, tomato, chive, rice, soy paper, and peanut curry. Add less then a tiny pinch of wasabi to the roll and you’ve got a great new flavor going on. 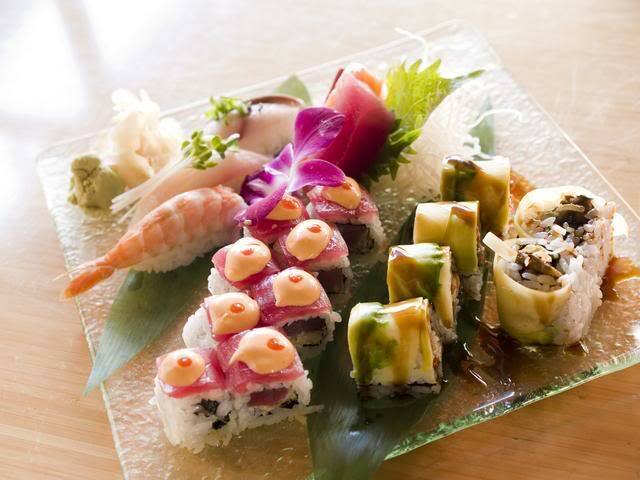 If you like more of the typical sushi texture go with this roll. My friend ordered cold sake (which I discovered doesn’t only come hot). I’m not sure what kind he ordered, but it tasted like a sweet coconut wine with a hint of alcohol. I recommend this to anyone who wants something to drink aside from water. As a dedicated viewer of WeTV’s “Platinum Weddings” since the age of seventeen, my expectations in all-things-weddings are extremely high. Or maybe I just have good taste? Either way, I feel terrible for my future husband and his wallet in regards to my “dream” wedding…sort-of…I feel at that point, he should already know what he’s getting himself into. So, when I find something unique or extravagant locally, you can only imagine my excitement. Therefore, I have to share. The cake is one of the most important parts of a wedding or even party for that matter. It has to accentuate the event and reflect the theme accordingly. I discovered one of the most amazing cake chefs in Florida-Sugar Chef. Those were only a few examples of the many cakes in their gallery on their website. They also cater to other special occasions. According to Sugar Chef, their cakes cost around $5.00-$9.00 per person. Not bad and I’m sure you get what you pay for. These cakes are not only unique, but great quality. You can tell they spend a lot of time on them. Sugar Chef, I’ll see you when I plan my walk down the isle. Come join us this thursday, June 4th from 6:00p.m. until 8:00p.m. to enjoy tasty organic treats and ambiance only Palm Beach Island can provide at the grand opening of new restaurant, da Francesco! Da Francesco features a healthy array of organic Italian dishes such as pizza, pastas, seafood and salad. This trendy restaurant, operated by restaurant tycoon Frank Cilione, is attached to the recently renovated lounge, 251 Palm Beach, located at 251 Sunrise Avenue. What’s better than eating delicious carbs (during bathing suit season) that’re actually good for you? 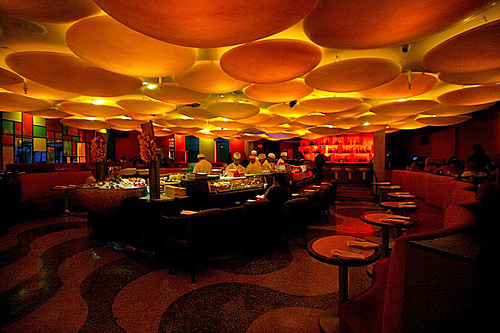 Not only is the food unique, but the restaurant’s design is created to dazzle as well. Oh…. and did I mention CARBS…that are ok to CONSUME?? If you would like to attend, please RSVP by calling Shamin Abas Public Relations at (561)-366-1226 .